What is a Toner Cartridge and How to Choose Yours. 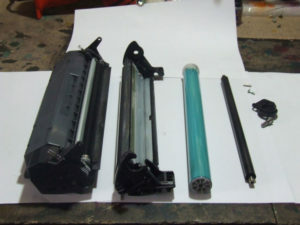 A toner cartridge is a vital part of any laser printer. The cartridge consists of a fine powder which is called toner. This powder is the main difference between the toner and the ink cartridge which uses a liquid ink instead. Toner cartridges are thus only meant for use in laser printers. The ink source used in the cartridges determines the outcome of the prints. To know what printer to use and what toner to buy it is necessary to know the basics of how a laser cartridge functions. Plastic and pigment are the two components of a toner and each serve a different purpose. The pigment component is responsible for the colour of the prints. Pigment is blended with plastic and when it is subjected to the heat fuser of the printer the toner melts. The melted output then binds to the blank paper that is inserted into the laser printer. We at CTEC basically deal with two types of laser cartridges. Our house brand of high quality compatible toner cartridges are manufactured with high quality components by qualified technicians using the latest and best technology available. This is our main focus of our business. For those that are interested in quality photo printing and high end graphics we can recommend original brand name toner cartridges at competitive prices. There is no difference in the way that any of these types of toner cartridges function. The basics of the process as described above stays the same. The only difference might be in the quality of the output and that depend on quite a few factors. OEM or Original Equipment Manufacturer refers to the company that manufactured the toner cartridge as well as the printer that it is intended to work in. The Original Equipment manufacturer (OEM) recommends that you should use only their product in their machines and that the original cartridge is of a better quality than lower priced generic brands. These original toner cartridges are very expensive due to their brand name status. Research has shown that there are actually not much difference in quality in the prints that are produced by original brand toner cartridges and compatible toner cartridges that are produced by reputable firms. In fact the research has shown that compatible toner cartridges even outperform brand name models in certain areas. Compatible laser cartridges are brand new toner cartridges that are manufactured by a third party. They are also often called generic toner cartridges. Brand new parts are used in the manufacturing of these cartridges. The third party has no affiliation with the original brand manufacturer. To explain it more simply the manufacturer manufactures a cartridge that looks and works the same as the original cartridge, but is not a genuine cartridge. Reputable compatible manufacturers produce toners according to strict ISO 9001 standards and are compelled to give guarantees on their products. The compatible toners go through rigorous testing to ensure quality and dependability. Because they are not brand name products they provide an affordable option when trying to save on your overall printing costs. Here at CTEC in Bloemfontein we provide you with our top quality range of compatible laser cartridges. CTEC are a business that has been operating in Bloemfontein for the past 7 years and our quality compatible toner cartridges provide customers with this affordable option to save costs on their printing expenses without sacrificing on quality. We also provide a warranty on our product. At CTEC we also provide a valuable service to our clients by refilling their toners. We thus save the customers hundreds of Rands in doing so. We don’t just bore a hole and refill the cartridge. Cartridges are thoroughly checked to ensure that clients get maximum value for their money. If parts need to be replaced the client will be informed. Toner cartridge refills at CTEC are done by our professional technicians using professional tools and methods. What to Consider When You Buy a Toner Cartridge? Buying a printer should be based on your specific needs. Therefore if you buy the printer for the purpose you intended it for, this should therefore influence your buying decision when it comes to purchasing your toner cartridge. The decision thereafter should then be solely based on quality vs price. We know that the original or genuine cartridge will provide us with the quality that we need, but we also know that it is expensive. Buying a generic toner cartridge that sells at half the price and still presents you with perfect to near perfect quality could definitely influence your buying decision. At CTEC our compatible toner cartridges provide perfect and close to perfect results depending on the purpose for which it is needed. Compatible laser cartridges generally perform excellent in relation to text printing and produce brilliant sharp prints. So if you need to print a lot of text documents you should get a laser printer and buy your compatible printer cartridges from us. Our friendly staff is there to assist you with their knowledge. Whether it is advice on what printer to buy or the choice between original or generic printer cartridges, we are always ready to assist you. When it comes to colour printing it is really hard to spot the difference between the quality of our compatible toners and the genuine toner cartridges. Although the compatibles do not use patented ink the huge savings makes it worth the buy. The bottom line is that unless your business relies on super high quality graphic or photo quality prints you can safely use our quality compatible toners. Getting Top Output With Your Toner Cartridges. Besides the quality of the output that generic toners give the customers, they usually also want to know if they will get the same page yield with the generic toners as with the original toners. CTEC is a reputable dealer and we can prove that our compatible toner cartridges provide exactly the same page yields as the genuine product. You can get information about page yields by phoning or emailing our sales department. You will find the contact particulars on our contact page.